This Sunday at the Fairmount Neighborhood Farmers Market, stock up on pastured meats from Fair Valley Farm and Fog Hollow Farm and fresh produce from Camas Swale Farm, including plenty of greens and root vegetables, and winter squash. As soon as you get home, roast some winter squash and you will be that much closer to making this praline pumpkin pie for Thanksgiving (delicious made with traditional pie pumpkin or kabocha squash). You will also have plenty of squash puree left over for pumpkin pancakes for a special fall weekend breakfast. 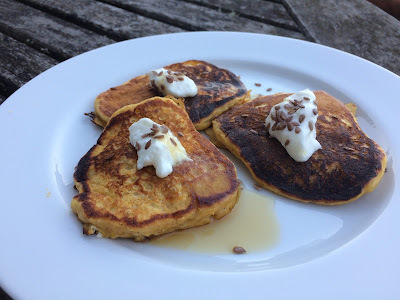 We devoured a batch this morning, served with dollops yogurt, sprinkles of flax seeds and maple syrup. 1. In a large bowl, whisk the flour, sugar, baking powder, baking soda, salt and spices together until well combined. 2. In a medium bowl, whisk the buttermilk, pumpkin purée, eggs, melted butter and vanilla extract until well combined. 4. Heat a lightly greased griddle or nonstick skillet over medium-low heat. Drop the pancakes into the pan using a heaping soup spoon, making sure to leave plenty of room in between for the batter to expand. 5. 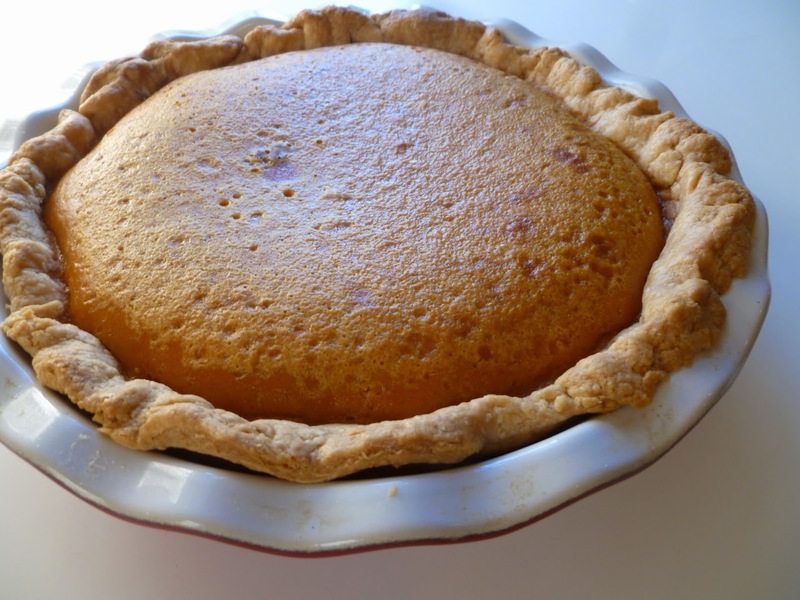 Cook for a minute or two, until the batter bubbles at the edges and browns on the bottom, then carefully flip. Cook another minute or two, until the batter is completely cooked through and the pancakes are puffy and deep golden brown. Repeat until all of the batter is used. Serve the pancakes as you make them or keep the pancakes warm as you cook them by setting them on a baking sheet in a 250-degree oven. 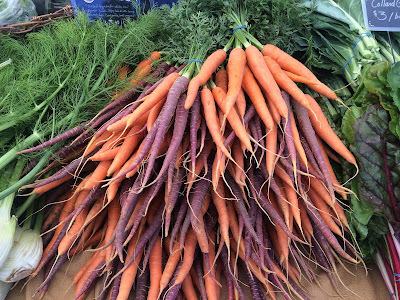 This Sunday at the Fairmount Neighborhood Farmers Market, stock up on pastured meats from Fair Valley Farm and Fog Hollow Farm and fresh produce from Camas Swale Farm, including plenty of greens and root vegetables such as sweet potatoes. 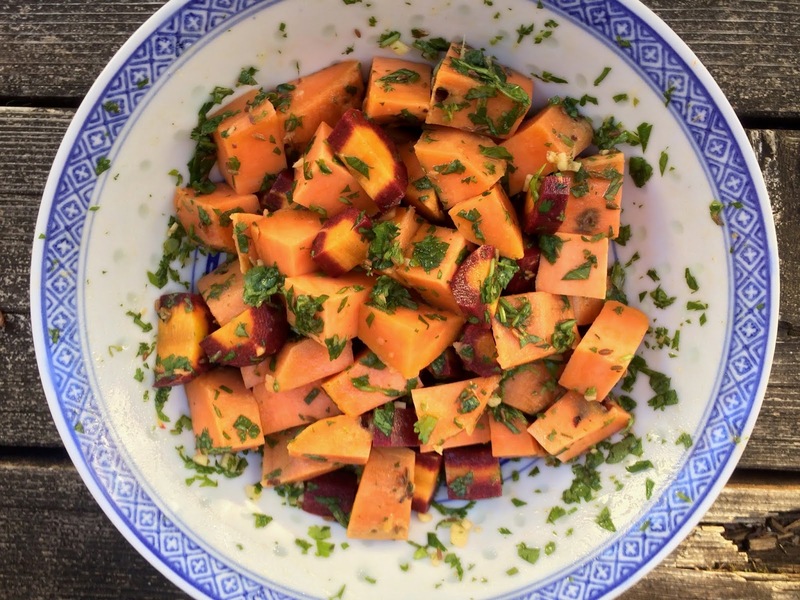 My standard dish with sweet potatoes is fries, but with the sunny weather we've been having, I felt like something lighter, so I went hunting for inspiration in my cookbook collection and came across a tamarind sweet potato salad in Neelam Batra's 1000 Indian Recipes. I didn't have tamarind or several of the other ingredients, but it inspired me to toss steamed sweet potato with toasted cumin seeds, a lime juice dressing, and plenty of mint and cilantro. 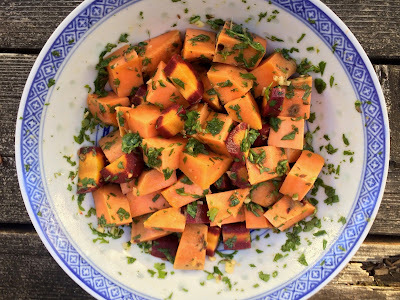 With the addition of some purple carrots for color and crunch, this turned into a bright and refreshing salad that might just reappear on our Thanksgiving dinner table as a contrast to the beloved but soft and bland standbys. 1. 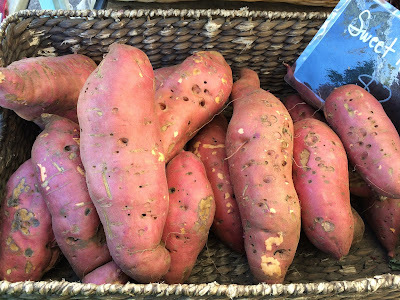 Steam the sweet potato to cook through. I pressure cooked it in an Instant Pot for 18 minutes. When cool enough to handle, peel and cut into 1 1/2 inch cubes. Peel the carrots and cut into similar sized cubes. 2. 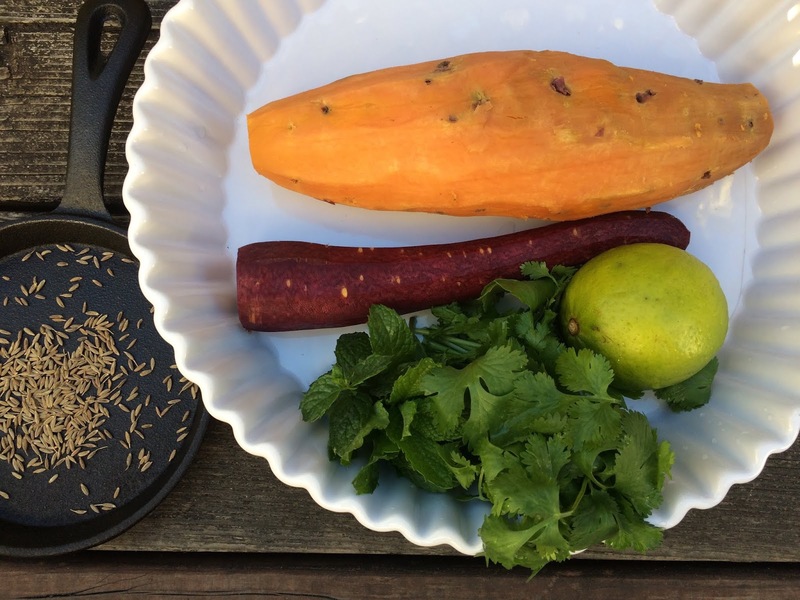 In a dry skillet, toast the cumin seeds briefly so that they become fragrant. Transfer to a mortar and bruise them with a pestle. Whisk together the cumin seeds with 1 Tbsp olive oil, juice from one lime, 1/2 tsp honey and a pinch of salt. Use the dressing to coat the sweet potato and carrots. Toss with the fresh herbs. Taste and adjust seasoning as needed. This Sunday at the Fairmount Neighborhood Farmers Market, stock up on pastured meats from Fair Valley Farm and Fog Hollow Farm and fresh produce from Camas Swale Farm, including plenty of root vegetables such as potatoes, parsnips, carrots, beets, and celeriac. Root vegetables are delicious roasted, and if you have the oven on, you should also roast a Fog Hollow Farm chicken. 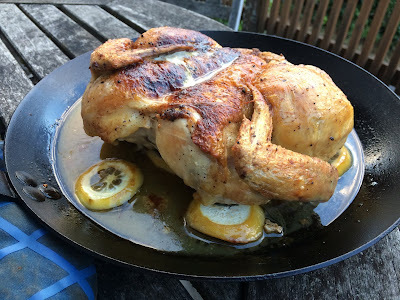 I like the method of spatchcocking the bird (removing it's backbone, which you can use to make a quick stock) and cooking it "under a brick" in a searing hot cast iron skillet to get the skin crispy and golden. Then you can flip it, tucking under some lemon slices and herbs to flavor the pan juices, and cook it at a lower temperature along with a sheet pan of cubed root vegetables. 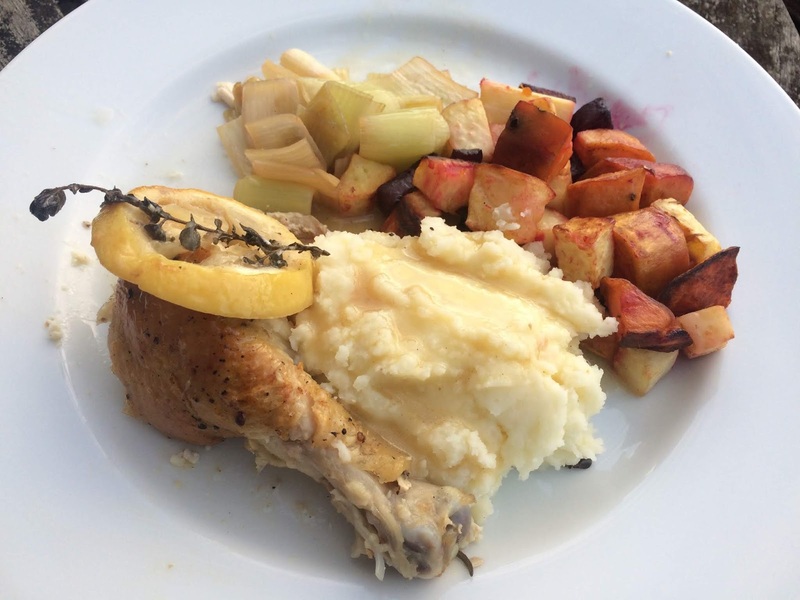 I served our chicken with mash potatoes (always a favorite in our household), braised leeks, and a quick lemony gravy made with the pan juices. It felt like a low key dry run for Thanksgiving, which reminds me to remind you to reserve your Fair Valley Farm Thanksgiving turkey. 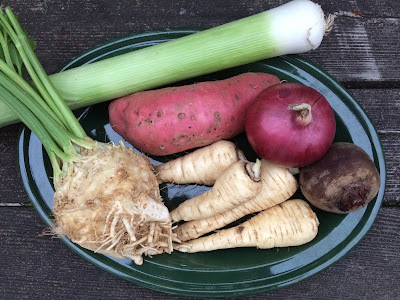 selection of root vegetables (parsnips, celeriac, beet, sweet potato), cleaned, peeled, and chopped into 1 inch cubes to make about 3 cups. 1. At least two hours and up to one day before you start to roast the chicken, spatchcock it. Using a sharp pair of scissors, cut along each side of the backbone from the neck to the tail, and remove the backbone (reserve for stock). Spread the chicken out and push down on the breast bone until you feel it break, so that the bird lies flat.Salt and pepper all over and rub the breast with olive oil. Refrigerate again if roasting in over two hours. 2. To make a quick chicken broth for the gravy, combine the chicken back bone with 4 cups water, 1 tsp salt, 4 sprigs thyme, 1 chopped onion, 1 chopped celery stock, or other vegetables you have around, and let simmer over low heat for 1 to 2 hours. Taste and add more salt if needed. Strain and reserve the stock. 3. About one hour before baking, place a large cast iron skillet in the oven and start preheating at 500 degrees. 4. Prepare all of the root vegetables, cleaning and peeling as needed, and cut into 1 inch cubes. Toss on a rimmed sheet pan with salt and a drizzled of olive oil. 5. When the cast iron skillet is very hot, remove it from the oven and carefully put the chicken in the skillet, breast side down, with the legs splayed flat. Place an oven-safe plate on top of the chicken and weigh it down with a second skillet or some bricks. Roast for 15 minutes, then take the chicken out of the oven and turn the oven temperature down to 350 degrees. Remove the weights from the chicken and transfer it to a plate. Distribute the lemon slices over the bottom of the chicken-cooking skillet, then the herbs, and then return the chicken to the skillet on top of the lemon and herbs, breast side up, and return the skillet to the oven. 6. Place the sheet pan with root vegetables in the oven when you return the chicken. Roast the chicken for about another 20 minutes until it is cooked through and an instant-read thermometer inserted into the meaty part of the thigh reads 155 to 165 degrees. Give the root vegetables an occasional turn and keep an eye on them. They will be done when they are soft through and have some char around the edges. They will likely need another 10 minutes after you take out the chicken. 7. When the chicken is done, remove the skillet from the oven. Transfer the chicken to a carving platter and let it rest. Transfer the lemon slices and herbs to a serving platter. Heat the skillet with the pan juices over medium low heat. Using a whisk, stir 1 Tbsp flour into the pan juices. Once the mixture thickens, gradually add 1 to 2 cups of stock while whisking until the gravy is the desired thickness. Taste and adjust seasoning with more salt, some fresh lemon juice, or a splash of sherry. 8. At this point the root vegetables should be done and you can remove them from the oven. Carve the chicken and transfer to the serving platter on top of the cooked lemon slices. Serve with the roasted vegetables and gravy. 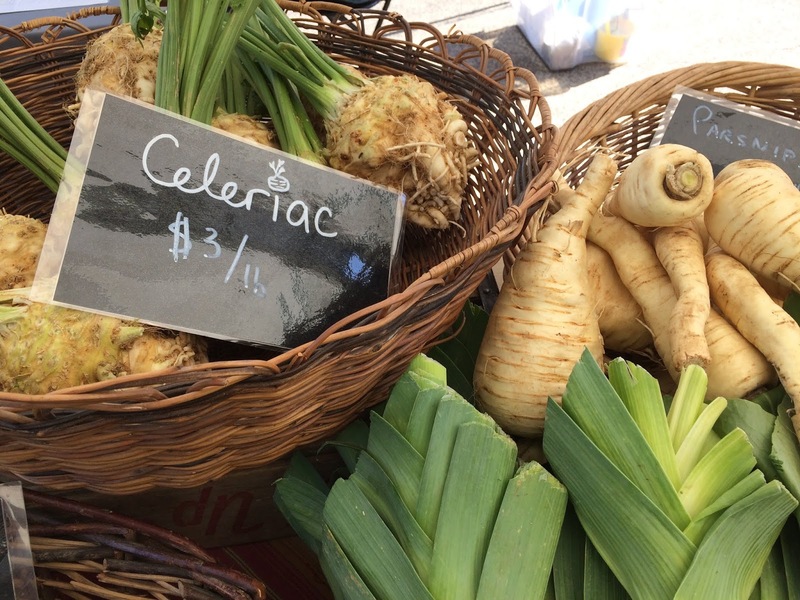 This Sunday at the Fairmount Neighborhood Farmers Market, stock up on pastured meats from Fair Valley Farm and Fog Hollow Farm and fresh produce from Camas Swale Farm, including plenty of root vegetables, squash, and bok choy. 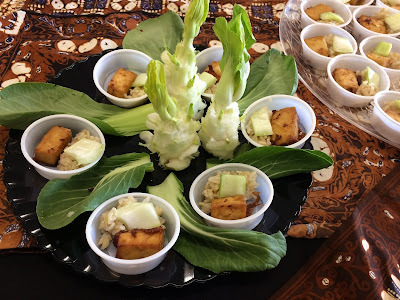 We had a period last spring when we ate a lot of bok choy while my son was concocting a recipe for a 4J elementary school cooking competition with the theme of "healthy, kid-friendly Asian fusion" and extra points for using brown rice, tofu, bok choy, ginger, and garlic. He decided to hedge his bets and use all of the above. For the tofu, he made a ginger and garlic version of baked tofu cubes from Deb Perelman's Smitten Kitchen Everyday, coated with a soy sauce and cornstarch mixture that gives them a crispy surface, and they were an immediate hit. The first iteration of the bok choy was another matter. He had steamed these until quite soft and served them limply over plain brown rice. His older sister pushed hers around her plate with teenage contempt. My son initially wrote this off to her being a picky eater, but ultimately had to concede that she represented his target audience, who might be equally as picky. So he went back to the drawing board and came up with the idea of making quick pickles with the crunchy bok choy stems. This proved to be much more popular and had the added benefit of providing some sweet and salty pickle brine to drizzle on the brown rice. His recipe was chosen as one of the two representing his grade school in the citywide competition. The big day came when they all prepared their recipes in a cavernous cafeteria. 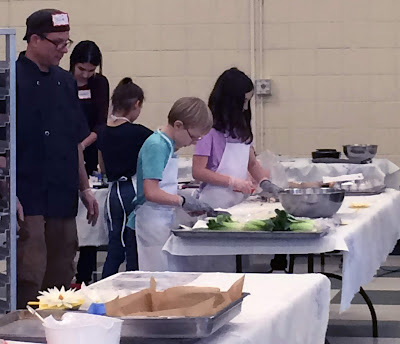 Working with awkward knife guard gloves, abiding by food handling regulations, and producing 50 tasting samples were all challenging, but he stayed cheerful through it all and even came up with an eye catching Dr. Seuss-esque food plating design using denuded bok choy stalks. 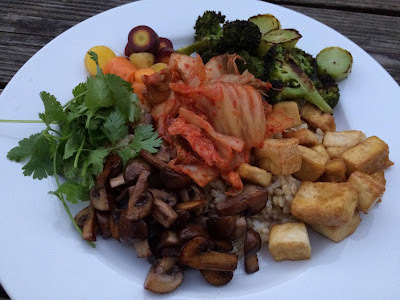 Perhaps most rewardingly, his recipes have made their way into our regular family meal rotation, as in this rice bowl with tofu puffs. 1. Preheat the oven to 400 degrees and line a rimmed baking sheet with parchment paper. 2. Set a pot of brown rice to cook. 3. Slice the tofu into 1/2 inch thick slices, and press between two cutting boards to drain off excess liquid. Cut the slices into 1/2 inch cubes. 4. In a large bowl, mix together the oil, soy sauce, corn starch, garlic, and ginger. Gently fold in the tofu cubes to coat with the soy sauce mixture. Spread them onto the parchment paper coated baking sheet and bake at 400 degrees for 30 or 35 minutes, turning once, until puffy and golden. 5. While the tofu bakes, prepare the quick pickles. Mix the sugar and salt into the hot water to dissolve and then stir in the vinegar. Allow to cool a few minutes. 6. 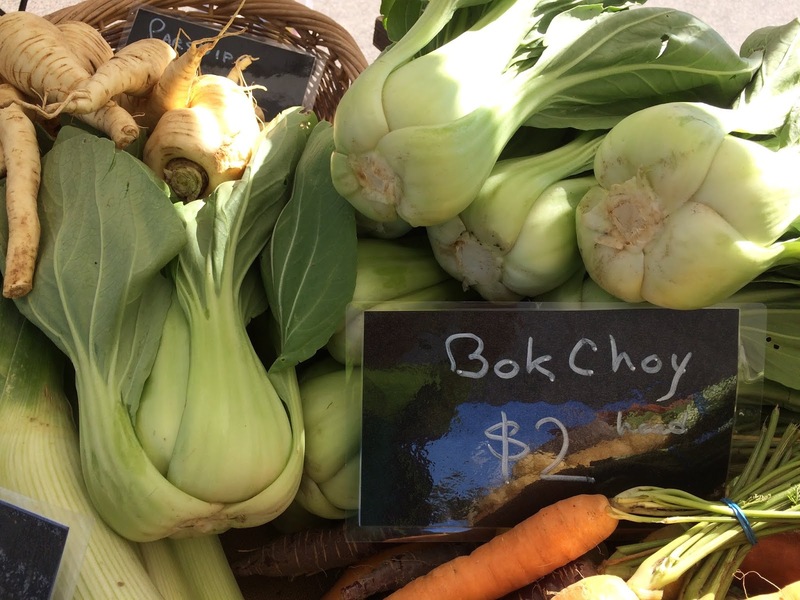 Separate the leaves from the bok choy head and rinse well. Cut the white stems from the green leaves and reserve the greens for another use (stir fry or salad). Cut the white stems into 1/2 inch pieces, stir into the pickle brine, and allow to marinate for at least 30 minutes. 7. Serve the tofu puffs with brown rice topped with the pickles and drizzled with some of the pickle brine. 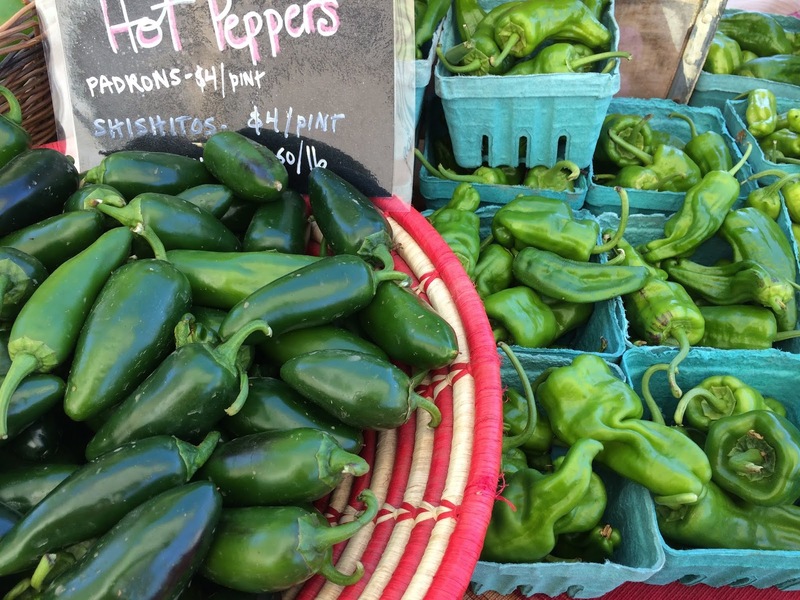 This Sunday at the Fairmount Neighborhood Farmers Market, stock up on pastured meats from Fair Valley Farm and Fog Hollow Farm and fresh produce from Camas Swale Farm, including peppers, Asian pears, and winter squash. With Fair Valley Farm's ground lamb, I've been making a Turkish ground lamb flat bread or pide adapted from the cookbook from Soframiz by Ana Sortun and Maura Kilpatrick with recipes from a cafe from my hometown of Cambridge, MA. 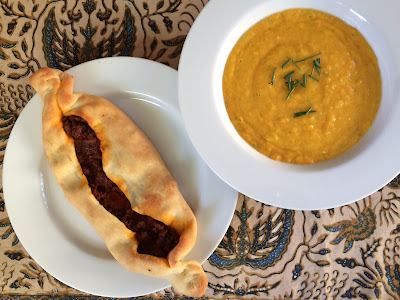 This recipe requires on stocking up on a few Turkish pantry items -- Turkish pepper paste and pomegranate molasses -- which I've found to come in handy for extra flavor for chilis (the pepper paste) and salad dressing (the molasses). The recipe is a bit of a commitment, so I've scaled it to make eight individual flatbreads, meaning that four can be frozen for another dinner. 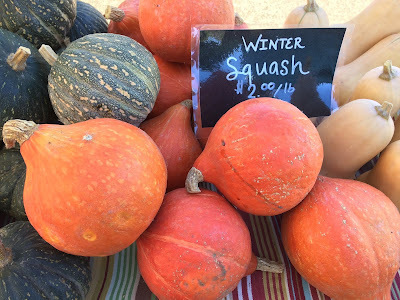 These are delicious with a big salad or bowl of soup. 1. To make the dough, combine the water, yeast and honey in the bowl of a stand mixer, whisk, and allow to sit for 5 minutes. Add the flour, salt, and 2 Tbsp olive oil. Using the dough hook, knead on low speed for about 5 minutes, until the dough is smooth. If it feels stiff, you could add another Tbsp or two of water. Transfer to a large oiled bowl, cover, and allow to rise until doubled in size, at least 1 hour. 2. to prepare the lamb filling, heat a skillet over medium heat. Add the olive oil and diced onion and cook until glassy. Then add the dried spices and a pinch of salt, allow them to bloom in the oil for a minute, and then add the ground lamb. Cook, stirring, until the lamb is lightly browned, about 8 minutes. Add the tomato paste, pepper paste, and minced garlic and cook until dry, about 5 more minutes. Stir the pomegranate molasses, taste, and add more salt if needed. 3. Preheat the oven to 400 degrees. Cover two baking sheets with parchment paper. Turn the dough onto a lightly floured surface and divide into eight pieces. Roll each piece into a long oval. Divide the lamb filling between the eight dough ovals, spreading it along the center length of the dough and leaving an inch free on each side. Fold the long ends over the lamb filling, leaving a gap in the center, and pinch the ends together to make a canoe shape. Transfer four pides to each baking sheet. Brush the top dough with the remaining Tbsp olive oil. Baked until golden brown, about 25 to 30 minutes. Serve warm. 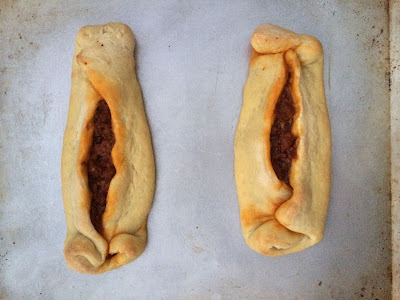 Once cooled, the pides can be frozen and then reheated. 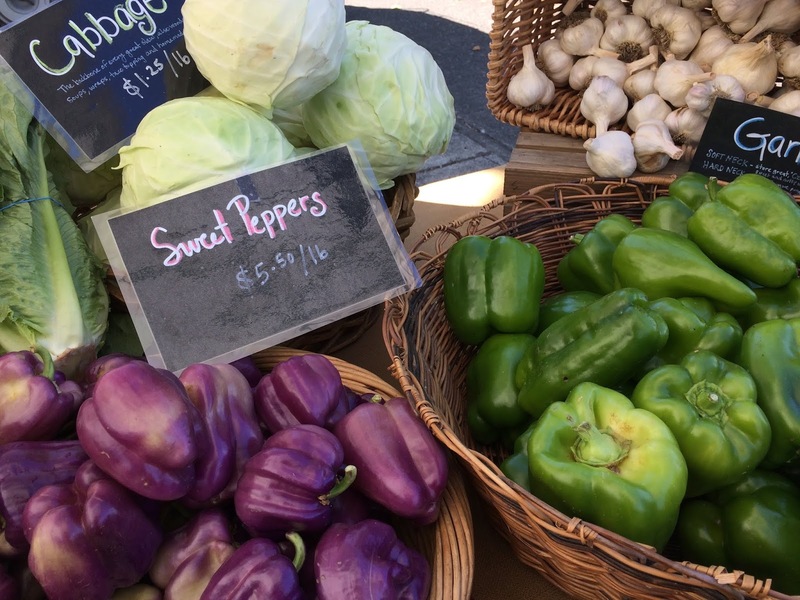 This Sunday at the Fairmount Neighborhood Farmers Market, you'll find pastured meats from Fair Valley Farm and Fog Hollow Farm and fresh produce from Camas Swale Farm, including greens, peppers, and winter squash. 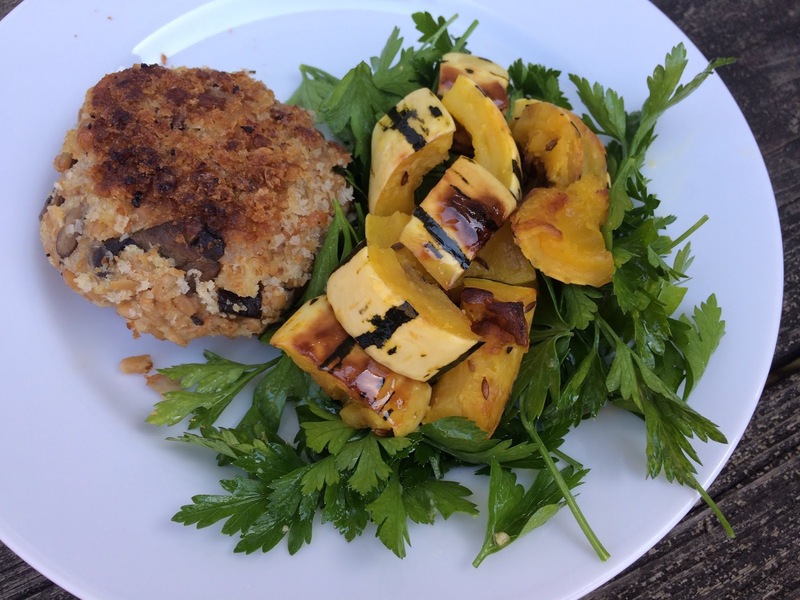 Fall is officially here and so are the fixings for cooler weather meals, like these mushroom barley cakes I made from leftover barley risotto and served with a salad of flat parsley leaves and roasted delicata squash. Mix together about 1 cup barley risotto with 1 egg and 1/2 cup bread crumbs. Spread the remaining breadcrumbs on a plate. Shape into 4 patties. If you like, you can stuff a piece of mozzarella in the center of each patty, so that it will melt when it cooks. Roll each of the patties in the remaining bread crumbs to coat. Heal a large skillet over medium heat and add a generous amount of olive oil. Add the patties and allow to cook, undisturbed, until nicely toasted. Carefully flip the patties and cook on the second side until browned. 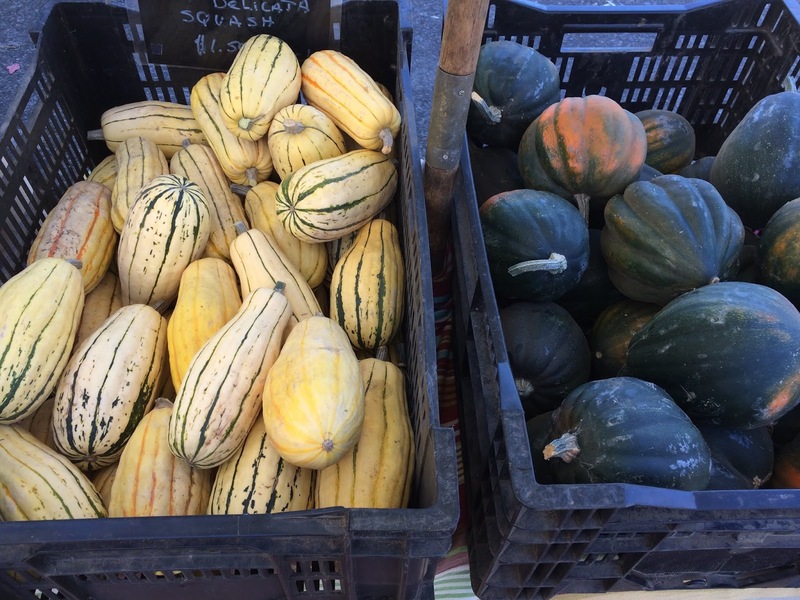 Serve at once, with a salad such as this one with kale and delicata squash. 1. Use scissors to cut the dried mushrooms into bitesized pieces into a large measuring cup. Add the broth or water and microwave until the liquid has small bubbles. Let sit to rehydrate the dried mushrooms while you prepare the other vegetables. 2. 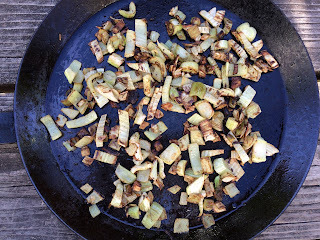 Brush off any dirt from the cremini mushrooms and cut into quarters or eighths. Turn the pressure cooker to saute. Add the olive oil and cook the mushrooms, seasoned with salt and pepper, until they release their juices and then concentrate them. Add the tablespoon of soy sauce and allow this to absorb into the mushrooms. 3. Add the butter and the chopped onions and cook until the onions are glassy. Now add the pearled barley and cook to coat in fat, about one minute. Add the white wine or vermouth and allow to cook down. Now add the rehydrated mushrooms and broth, pouring slowly so that any grit from the mushrooms is left behind. Set the pressure cooker to high pressure for 18 minutes. When the time is complete, carefully release the pressure. Turn the saute setting back on and stir in the pecorino romano. Taste and add more salt and pepper as needed. Serve warm. Note: the risotto can also be made on the stove top, simmering for about 40 minutes until soft. You can double the recipe if you'd like to be sure to have leftovers for risotto cakes. 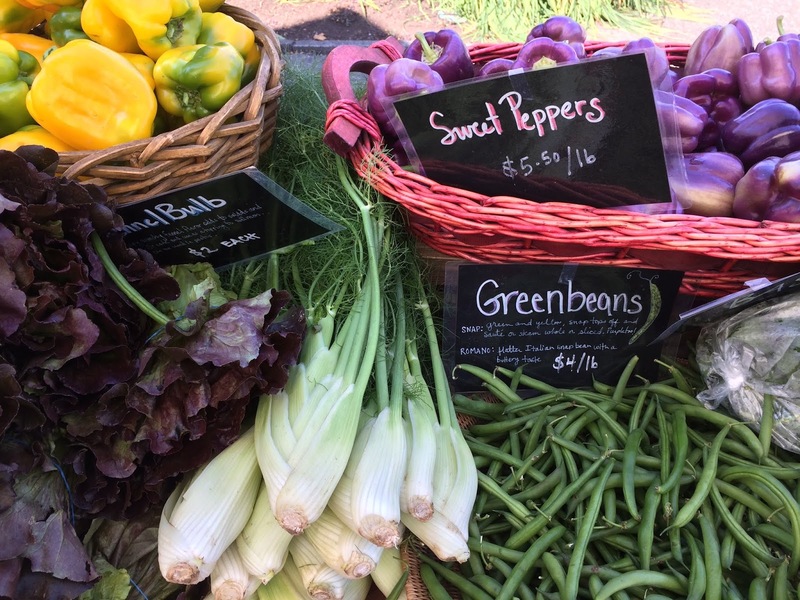 This Sunday at the Fairmount Neighborhood Farmers Market, you'll find pastured meats from Fair Valley Farm and Fog Hollow Farm and fresh produce from Camas Swale Farm, including celery, greens, peppers, and winter squash. Having weathered our first full week back at school, and with the fall chill in the air, this morning felt like the time to have a hearty, celebratory breakfast. 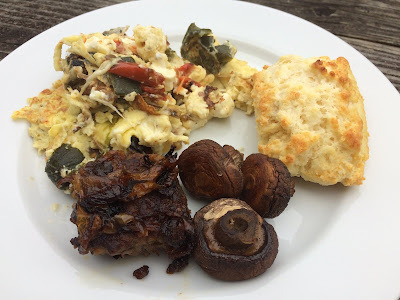 I made a batch of these buttermilk biscuits, fried up some Fair Valley Farm sausage meat into patties with caramelized onions, and whipped up some scrambled eggs with feta cheese and left over roasted eggplants and peppers from Camas Swale Farm. A leisurely weekend breakfast was just the right prescription to offset the weekday mornings' increased hecticness and dwindling summer sunlight. Heat a skillet over medium low heat. Whisk the eggs in a bowl with salt and pepper. 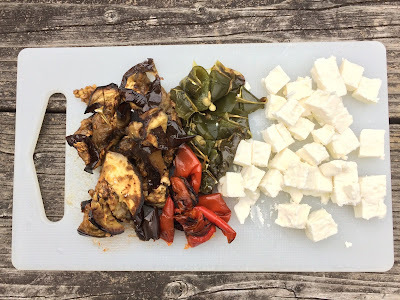 Prepare the roasted vegetables and feta cheese. Melt a pad of butter in the skillet and swirl to coat. Pour in the egg mixture and then sprinkle over the cheese cubes and chopped vegetables. Use a fork to pull the cooked edges of the eggs to the center and tip the pan to distribute the liquid eggs outward. Repeat until all of the eggs are cooked. Immediately transfer the scrambled eggs to two warm plates. Shape the sausage meat into 8 to 10 small patties, 1 inch thick. Heat a skillet over medium heat. Coat with a slick of neutral vegetable oil. Add the sliced onions to the pan and toss to coat in the oil and to break up the onion layers into strands a bit. Move the onion to the center of the pan and add the sausage patties. Allow to cook until well browned on one side, then flip and cook on the other side until the meat is completely cooked through. Meanwhile stir the onion strands occasionally so that brown nicely but do not burn. Serve warm. 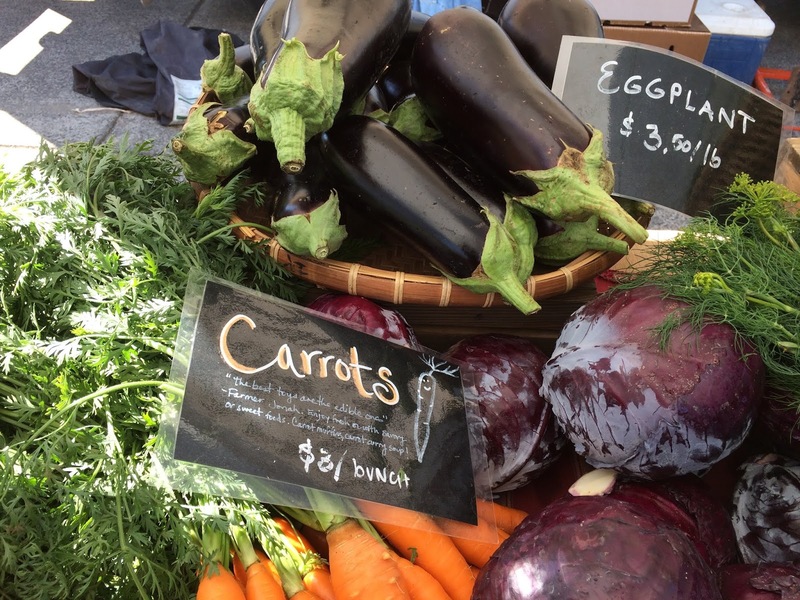 This Sunday at the Fairmount Neighborhood Farmers Market, you'll find pastured meats from Fair Valley Farm and Fog Hollow Farm and fresh produce from Camas Swale Farm, including tomatoes, eggplants, summer squash, peppers, and corn on the cob. 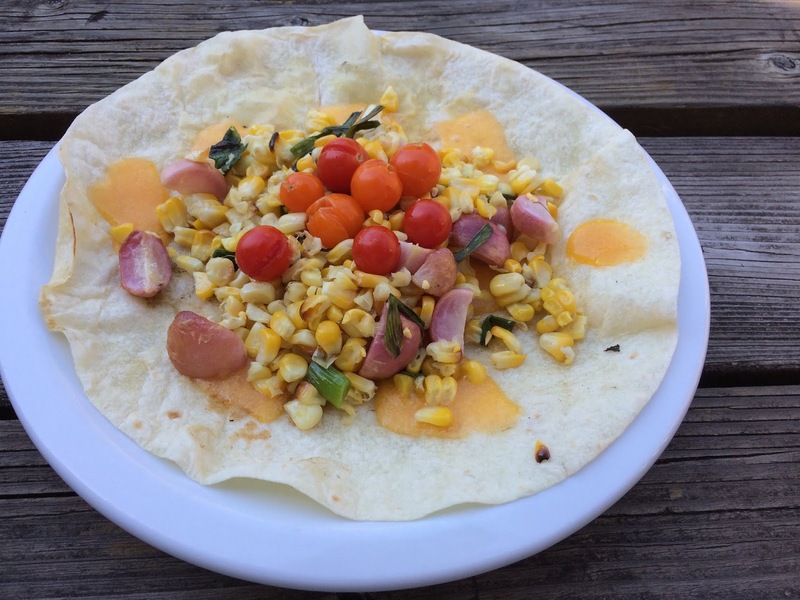 If you are exhausted from the first week back to school, plan to treat yourself to an easy supper of seared corn and scallion quesadillas, which are so simple that they don't need a formal recipe. Just heat a griddle or big skillet over medium high heat, give it a slick of oil, and throw on a husked corn cob and some whole scallions to sear. Meanwhile slice some cheddar cheese, rinse some cherry tomatoes, locate some tortillas and perhaps some other vegetables (above I had some leftover roasted radishes handy). When your vegetables have charred, slice the scallion and cut off the kernels into a bowl. Turn the heat to medium low. Toast a tortilla on one side until it starts to brown, then flip and cover with slices of cheese and the seared vegetables. Cook on the second side until the cheese has melted. Serve with cherry tomatoes and your favorite hot sauce. 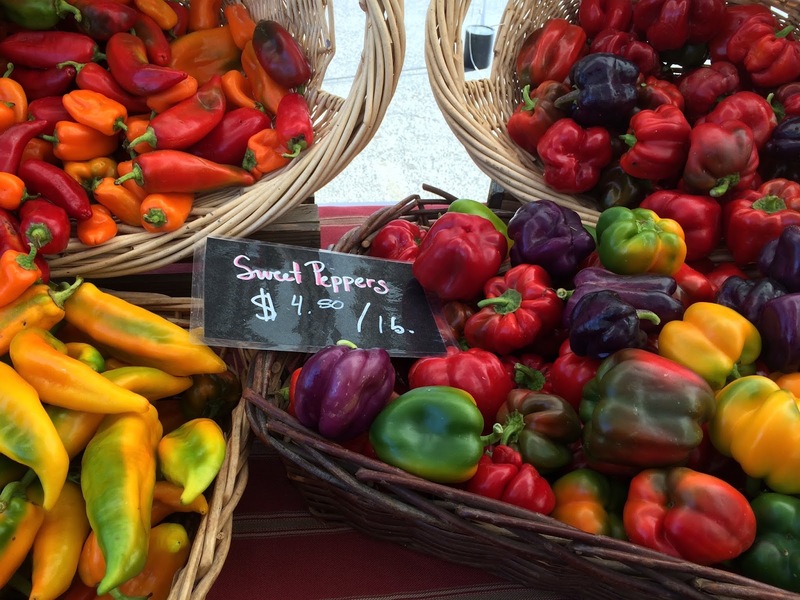 You can shop for all of your Labor Day weekend supplied this Sunday at the Fairmount Neighborhood Farmers Market. You'll find pastured meats from Fair Valley Farm and Fog Hollow Farm and fresh produce from Camas Swale Farm, including tomatoes, eggplants, summer squash, and peppers for grilling. 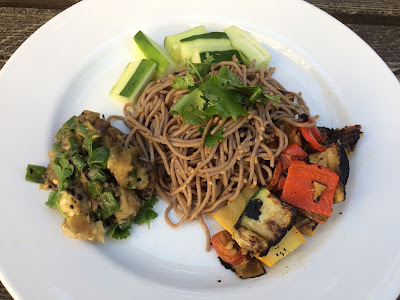 If you are planning to grill this weekend, I can highly recommend a grilled vegetable version of bibim guksu, which is a variation on Korean bibim bap, but with soba noodles instead of rice. We've made this dish a couple times this summer with grilled vegetable, chicken skewers, smokey Chinese eggplant salad, crunchy cucumbers, cilantro, and kimchi. Every time it's been gobbled up before I can get a picture of the full spread. Cook in salted boiling water until barely cooked through (about 4 minutes), then immediately rinse under cold water until entirely cooled. Toss with the bibim guksu sauce (below). Mix together all the ingredients. Taste and adjust flavorings as desired. Serve the noodles at room temperature with grilled vegetables and meats, Chinese smokey eggplant salad (below), fresh cucumbers and cilantro, and kimchi. 2. Mince the garlic and dice the eggplant pulp. Combine in a bowl and toss with the remaining ingredients. Garnish with cilantro leaves if you like and serve with soba noodles. 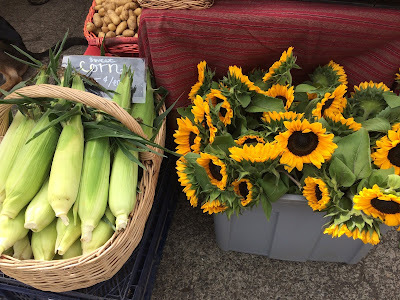 At the Sunday at the Fairmount Neighborhood Farmers Market this week you'll find pastured meats and eggs from Fair Valley Farm and Fog Hollow Farm and fresh produce from Camas Swale Farm, including lots of melons, tomatoes, corn, basil, parsley, and fennel. 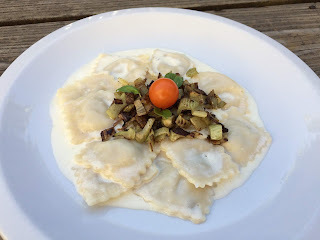 To make a garnish for a pound of Hideaway Bakery ravioli, I experimented with deeply caramelizing diced fennel bulb like shallots or scallions, cooked well past "glassy," almost to the point of "burnt." This treatment mellowed the anise flavor and brought out a nutty sweetness that added complexity to a rich cream sauce, once again proving the utility of the Maillard reaction. Wash and trim the fennel bulb, reserving the fronts for stock or garnish. Cut the bulb like an onion into a 1/4 inch dice. Heat a skillet over medium heat. When it is hot, add the oil and butter. When the butter foams, add the diced fennel and a pinch of salt. Cook, stirring frequently and watching it like a hawk to ensure that the fennel pieces brown nicely but do not burn, about 15 minutes. Remove from heat, taste and season with more salt and pepper, and serve on top of your favorite pasta or grain dish. At the Sunday at the Fairmount Neighborhood Farmers Market this week you'll find pastured meats and eggs from Fair Valley Farm and Fog Hollow Farm and fresh produce from Camas Swale Farm, including plenty of tomatoes and a selection of spicy peppers: jalapenos, padrons, and shishitos. 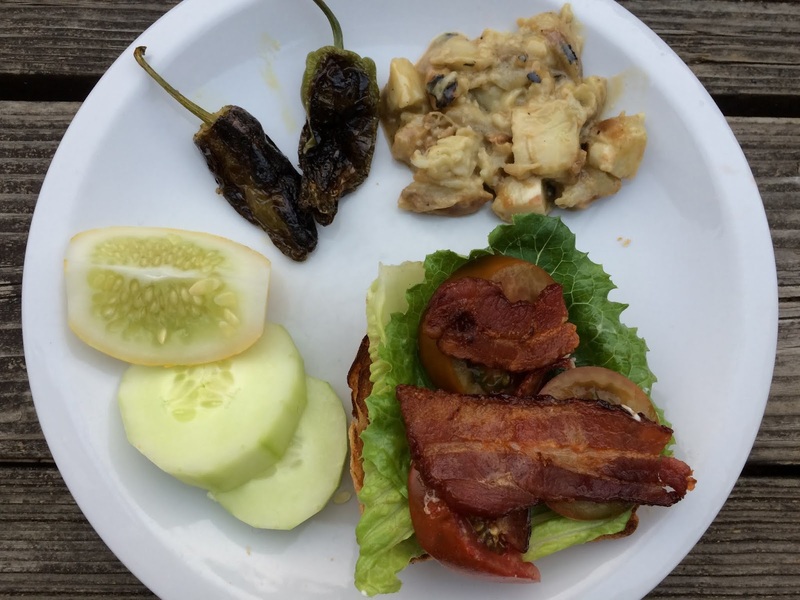 Don't let the summer go by without savoring a classic BLT. And as a few accompaniments, I can recommend some cool cucumbers, some blistered padron peppers, and a smoky grilled eggplant salad. 1. 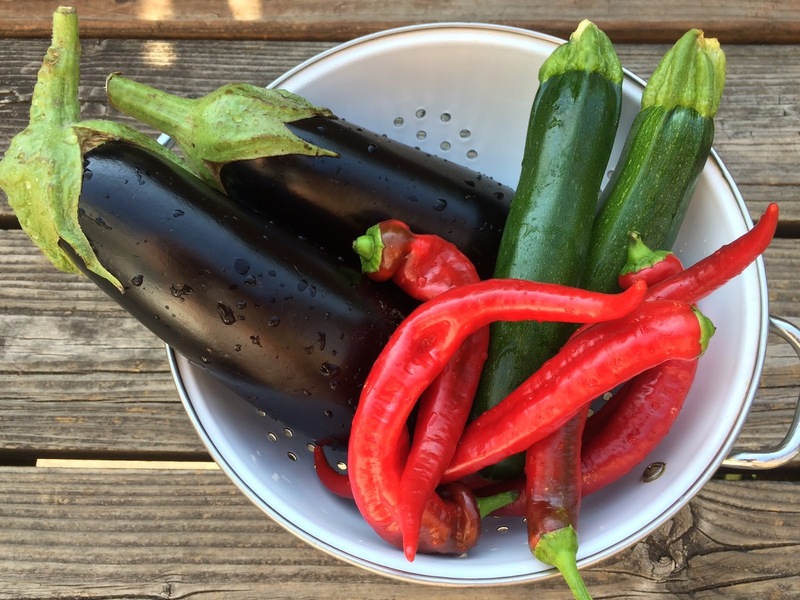 Hold the eggplant with tongs directly over a stove burner until it is scorched on all sides and softened to collapsing (for a bigger eggplant, you can start it over the burner and finish it in the oven. Or you can cook it whole in a grill). 2. Mix together the dressing of tahini, vinegar, olive oil, and salt. 3. When the eggplant is cool enough to handle, remove the top and the blistered peel (you don't have to be a perfectionist about this, some lingering char is nice). Cut into approximately 1/2 inch dice and fold into the dressing. Serve warm or at room temperature. 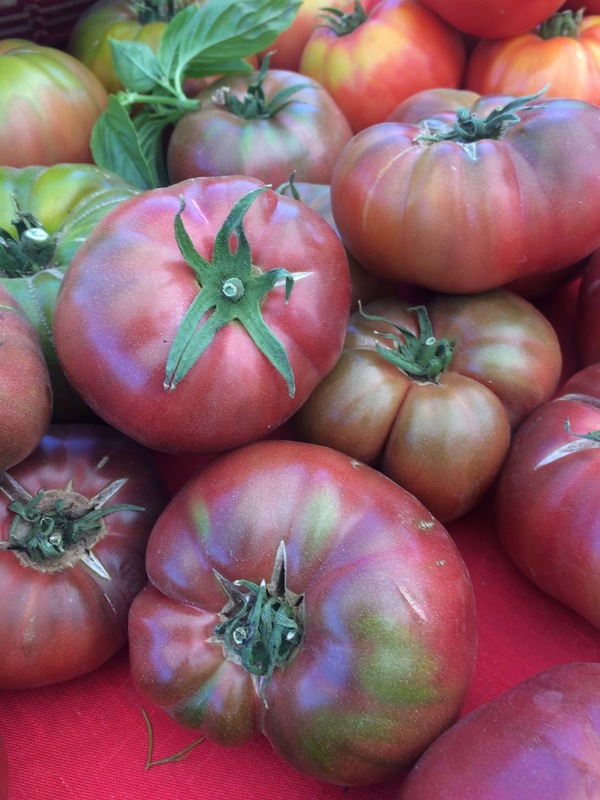 At the Sunday at the Fairmount Neighborhood Farmers Market this week you'll find pastured meats and eggs from Fair Valley Farm and Fog Hollow Farm, cut flowers from Tiger Lily Art Company, and fresh produce from Camas Swale Farm, including lots of tomatoes. When tomatoes are at their summer sweetest, I love eating them lightly roasted with fresh herbs. As a vehicle for their fragrant juices, I decided to make some polenta, using this Bon Appetit recipe for Instant pot polenta cacio e pepe. 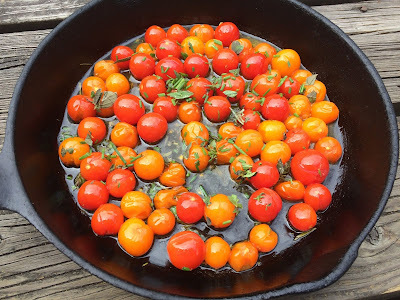 While the polenta cooked (in just 9 minutes), I roasted a pan full of cherry tomatoes with rosemary. Then I sprinkled on some more delicate herbs (chives, thyme, and oregano), poured over the polenta and ran it under the broiler. At this point, one could let it cool and harden and cut wedges to eat, but we couldn't wait for that and instead ate it as a delicious porridge spooned into bowls. 1. Preheat the oven to 450 degrees and put in a cast iron or oven safe skillet to warm. Rinse and the cherry tomatoes and herbs. Chop the rosemary leaves. Separately chop the other herbs. 2. In an Instant Pot, combine the polenta, water, salt and pepper. Cook on high pressure for 9 minutes and then release the pressure manually. Whisk the contents of the pot, adding 1 Tbsp of butter and the grated cheese, until it is a thick porridge. One can also prepare the polenta on the stove top like this. 3. 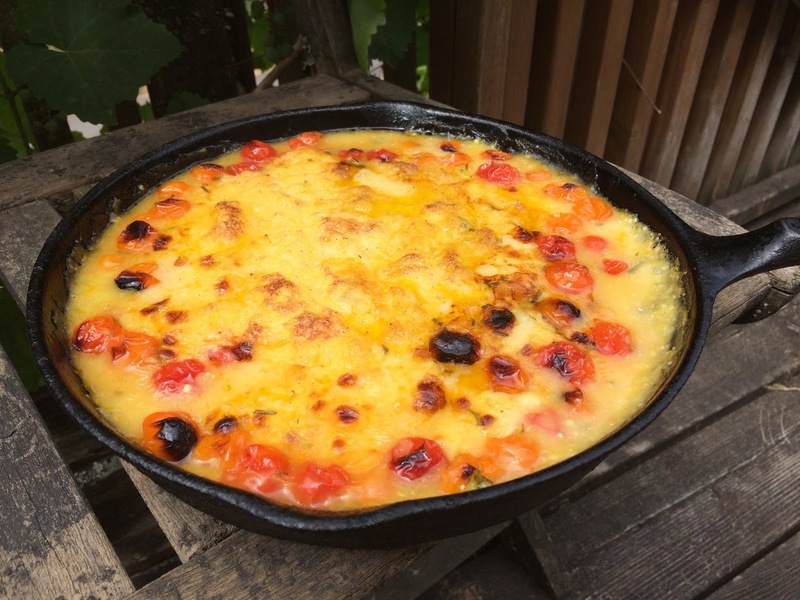 While the polenta is cooking, remove the warm skillet from the oven. Put 1 Tbsp of butter into the skillet to melt and then add the cherry tomatoes and chopped rosemary and roll around to coat. Roast the cherry tomatoes for about 12 minutes until they have collapsed and released some juices. 4. Remove the pan from the oven and turn the setting to broil. Sprinkle the other chopped herbs onto the cherry tomatoes. 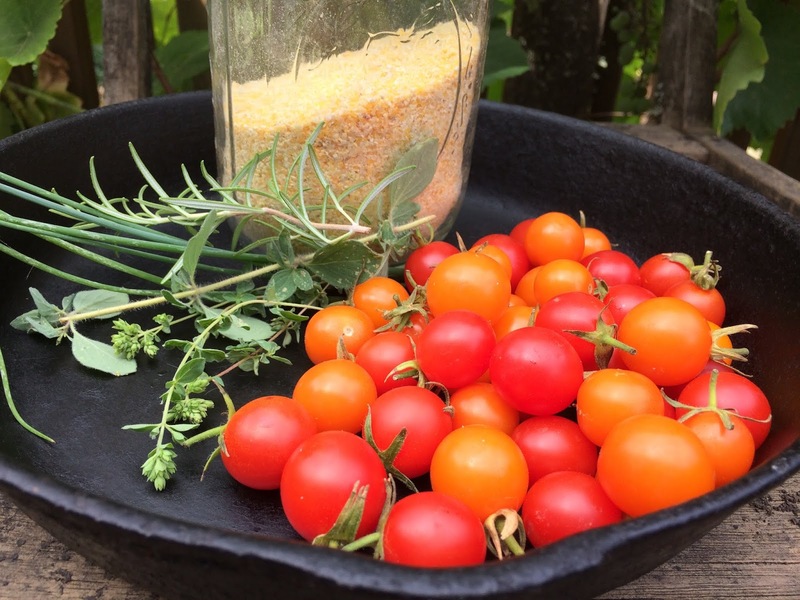 Use a spatula to layer the cooked polenta onto the roasted tomatoes. Put under the broiler for about 5 minutes until the top is golden brown. Serve immediately, spooning into dishes, or allow the pan to cook until the polenta has hardened and can be cut into wedges. Enjoy. This Sunday at the Fairmount Neighborhood Farmers Market, you'll find pastured meats and eggs from Fair Valley Farm and Fog Hollow Farm, cut flowers from Tiger Lily Art Company, and fresh produce from Camas Swale Farm, including eggplant, tomatoes, and corn on the cob. For the past year I've been cooking many variations on this chickpea pasta dish, in which the pasta cooks in chickpea broth, absorbing all of the flavors. It's come to the point that the rest of my family members will roll their eyes when I suggest this dish. 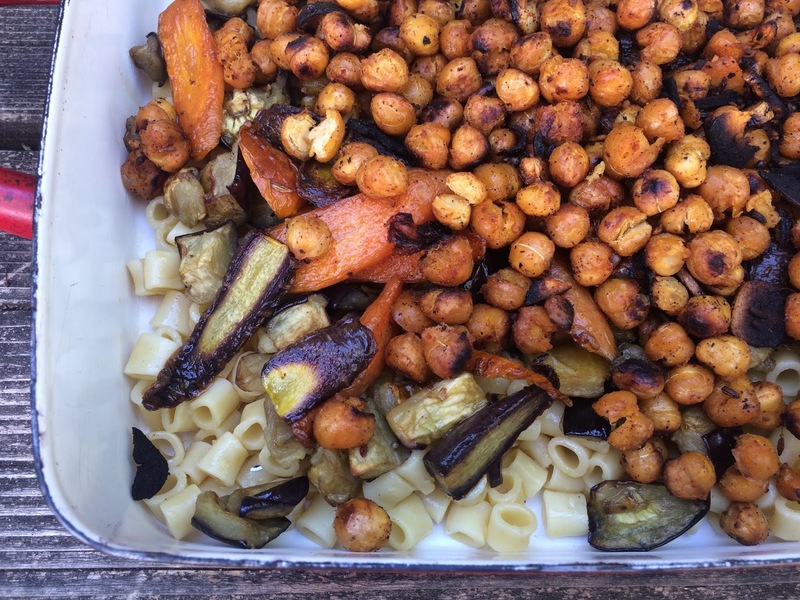 But tasked with bringing a side dish to a work picnic, I thought of a new variant on the theme: cooking pasta for a salad in the same broth used to cook chickpeas that I then roasted, along with eggplant and carrots, to layer on top. The pan was empty by the end of the picnic. 1. Rinse the chickpeas, transfer to a large cooking pot or Instant Pot insert, add water until they are covered by 2 inches, add 2 tsp salt, bay leaf, and a drizzle of olive oil. Cook on low heat until soft through or if using an Instant Pot, cook on high pressure for 40 minutes and allow the heat to release naturally. 2. When the chickpeas are cooked, drain them and reserve the cooking liquid. Taste and add more salt if needed. Return the chickpea broth to the pot, bring to a boil, and cook the pasta until just cooked but still firm. If using an Instant Pot, cook the pasta on low pressure for 5 minutes. Drain the pasta, toss with a little olive oil, and reserve. 3. Meanwhile prepare the vegetables. 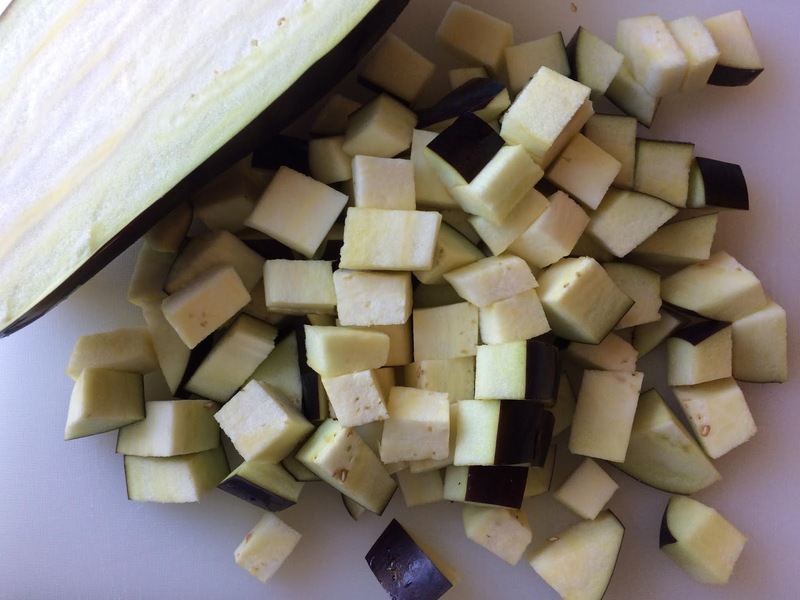 Cut the eggplant into 1/2 inch cubes, toss with a tsp of salt, and allow to drain for at least 20 minutes. Clean and trim the carrots and cut into 1/8 inch thick ovals. 4. Preheat the oven to 400 degrees and place in two sheet pans. In a mixing bowl, combine the cumin seeds, smoked paprika, and a pinch of salt. Peel and slice the garlic cloves and add to the bowl. Use a vegetable peeler to peel the lemon and cut the lemon peel strips into thin matchsticks and add to the bowl. Add the chickpeas and a generous drizzle of olive oil and mix to coat the chickpeas with the spices. Transfer the chickpeas to one of the hot sheet pans and roast for about 30 minutes, shaking the pan occasionally, until they are well crisped and starting to brown. 5. In the same mixing bowl, toss the carrot slices with a another drizzle of olive oil and pinch of salt and transfer the carrots to the second sheet pan. Roast for about ten minutes, flipping once with a spatula, until they are cooked through and browned at the edges. 6. In the same mixing bowl, toss the drained eggplant cubes with another drizzle of olive oil. When the carrots are done, transfer them to a bowl, spread the eggplant cubes on the hot sheet pan, and return it to the oven. Roast the eggplant cubes for about twenty minutes, shaking the pan occasionally to flip, until they are cooked through and browned at the edges. 7. Assemble the salad. On a serving platter, layer the pasta, then the eggplant cubes, then the carrots, and then the chickpeas with all of the roasted cumin seeds, lemon peel, and garlic slices. Juice the lemon and drizzle over the platter, along with a final drizzle of olive oil. Serve at room temperature. 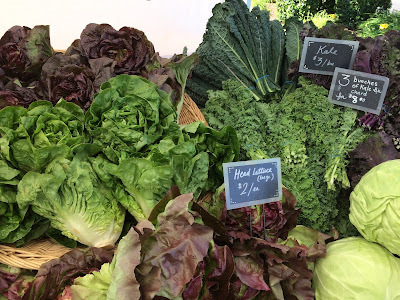 This Sunday at the Fairmount Neighborhood Farmers Market, you'll find pastured meats and eggs from Fair Valley Farm and Fog Hollow Farm, cut flowers from Tiger Lily Art Company, and fresh produce from Camas Swale Farm, including lettuce, gorgeous heirloom tomatoes, and beans. With the hot temperatures I have been searching for no cook, refreshing dishes, and had a craving for Thai flavors. 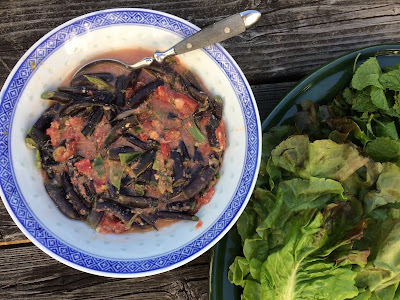 I found just what I was looking for in Jeffrey Alford and Naomi Duguid's Hot, Sour, Salt, Sweet: a version of green papaya salad, but made with long beans. 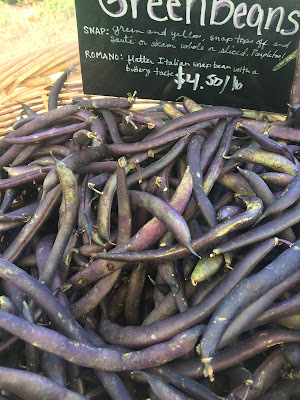 Swapping in Camas Swale's purple beans was the perfect way to preserve their brilliant color while infusing them, after a good pounding in a mortar, with vibrant lime juice, fish sauce, chiles, crushed peanuts, and tomatoes. 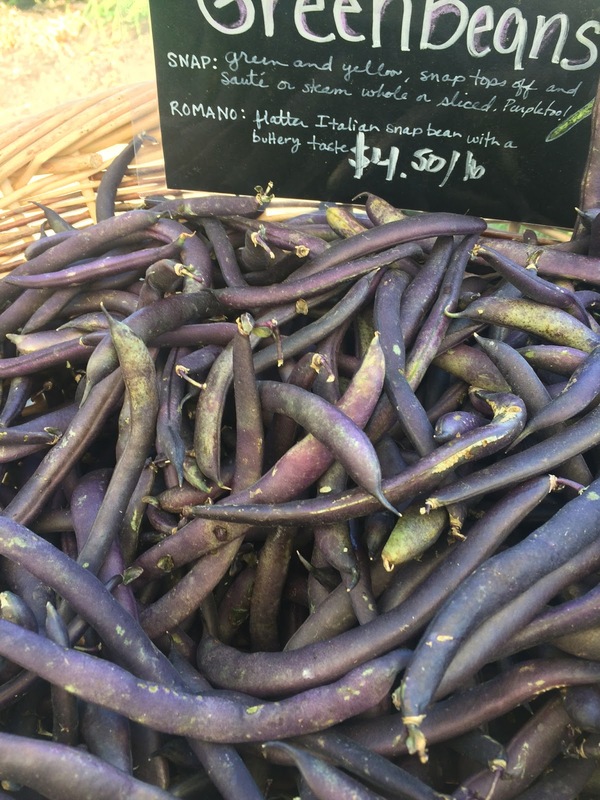 1/2 lb long beans or green or purple beans, trimmed, cut lengthwise in half, and the cut crosswise into 1 1/2 inch lengths. (Note, if the beans are large and tough, you can parboil them briefly in boiling water and refresh them in cold water before trimming and cutting). Place the garlic, salt, peanuts, dried shrimp, chiles, and sugar in a large mortar or in a food processor and pound or process to a paste. If using a processor, transfer the paste to a bowl. Stir in the lime juice and fish sauce, then add the chopped tomatoes and a generous handful of beans. 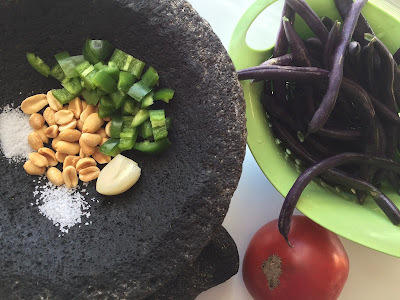 If using a mortar, stir in the lime juice and fish sauce, the tomatoes, and the handful of beans. Pound with the pestle or the back of a wooden spoon, being careful not to splash yourself, to mash the beans a little and combine them with the flavorings. Gradually add the remaining beans, mashing and blending as you do. Taste for salty-hot-sweet balance and adjust the flavors as you wish. Mound onto a serving plate lined with lettuce leaves. Place the wedges of cabbage around the edge of the plate. Serve immediately. 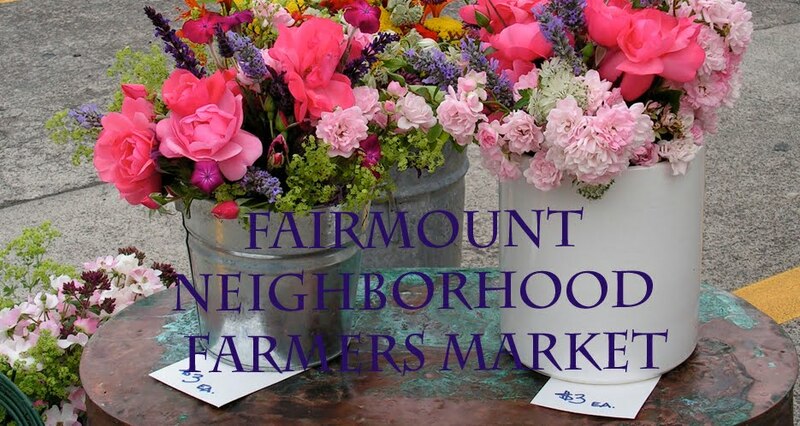 This Sunday at the Fairmount Neighborhood Farmers Market, you'll find pastured meats and eggs from Fair Valley Farm and Fog Hollow Farm, cut flowers from Tiger Lily Art Company, and fresh produce from Camas Swale Farm, including lettuce and other greens, potatoes, green beans, and heirloom tomatoes. During the summer months, a favorite meal at our house is self assembled salad Nicoise with lettuce, tomatoes, boiled eggs, potatoes, and green beans, and tuna in olive oil. As a treat last week, I made a batch with fresh olive oil poached tuna. This time, I experimented with making the components in an Instant Pot. It didn't necessarily save time, but it turned out to be pretty efficient with fewer pots to wash in the end. If you don't have an Instant Pot, you can easily cook the components on the stove top and it will be just as good. 1. In a ceramic ramekin that will fit the fish snuggly, cover the bottom with the shallot and garlic slices. Salt and pepper the fish and layer it on top of the shallot and garlic. Top with the fennel seeds and lemon zest and pour over olive oil to immerse the fish. Cover with plastic wrap and refrigerate to marinate for 1 hour up to 24 hours. 2. Set up the Instant Pot with 1 cup of water in the pot and a steamer basket. Rinse the potatoes and put them in the steamer basket. Layer on the eggs. Close the lid, seal the valve, and cook on LOW pressure for 4 minutes for jammy eggs or 5 minutes for hard boiled. While the pot is pressurizing, prepare a large ice water bath. When the timer is done, immediately and carefully vent the steam, remove the lid, and transfer the eggs to the ice water bath. 3. Place the green beans on top of the potatoes in the steamer basket and cook on LOW pressure for zero minutes. When the timer is done, immediately and carefully vent the steam, remove the lid, and transfer the beans to the ice water bath. 4. Remove the plastic wrap from the tuna ramekin and cover with tin foil. Make a tin foil sling to be able to lower the ramekin in and out of the pot. Layer the ramekin on top of the potatoes and cook on LOW pressure for 5 minutes for medium rare tuna or 6 minutes for more well done. When the timer is done, immediately and carefully vent the steam. Check the tuna and potatoes for desired doneness and cook either or both for a little longer if needed. 5. Arrange a platter with lettuce and tomato wedges. Drain the eggs and beans. Peel and half the eggs and arrange with the beans and potatoes on the platter. 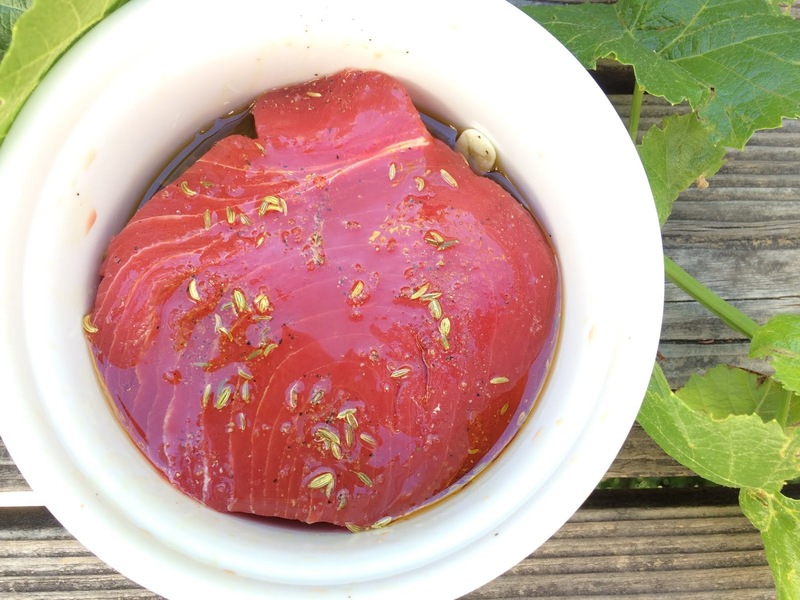 Mix the olive oil from the poached tuna into a vinaigrette with mustard and vinegar to taste. 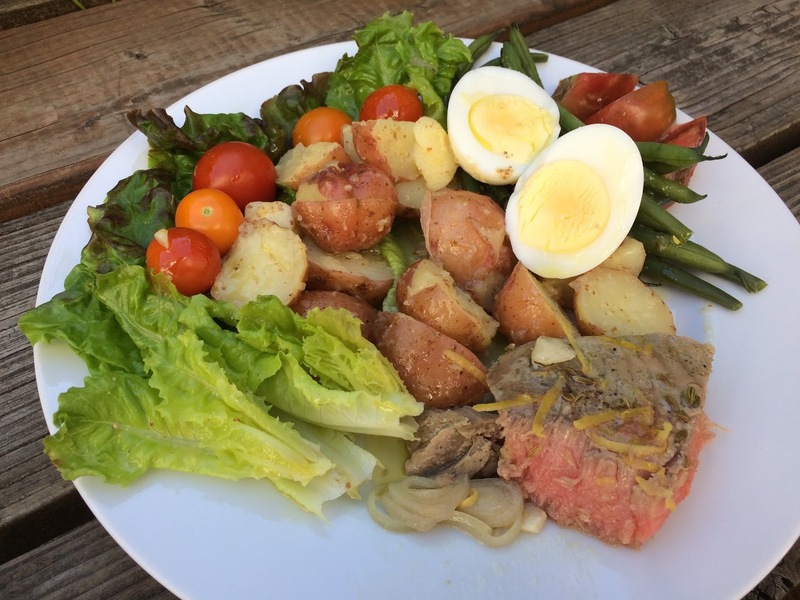 Serve the salad fixings, tuna, and vinaigrette for everyone to assemble their own salad. Enjoy.